I was done baking and photo-ing Christmas goodies for you all. Had started eating a large amount of vegetables and rice, just on account of it all. Then…I got a little bit cookie-wowed. And, I’m embarrassed to say…. This is the kind of sick and twisted person I am. Put those things together and I’ve got a real problem on my hands. Vegetables and Rice just aren’t quite as cute or fun. But it’s the darn spankin’ truth. I will give a bit of a warning, however. but they do take quite a bit of time. don’t add this to your list of “pre-Chritmas activities”! then treat your self to a fun little cookie day! 1. Combine the flour and baking soda in a medium sized bowl. 2. In your stand mixer, or with hand held beaters cream the butter and sugar. Add the egg and extracts and mix well. 3. Add the flour mixture a little bit at a time and beat just until combined. Be sure to scrape the sides and bottom of the bowl. The dough will be a bit crumbly. 4. Place the dough on a floured surface and knead to help it from crumbling all over. 5. Roll out 1/2 of the dough on your floured surface. Cut into what ever cookie shapes your little heart desires. Place on a sprayed cookie sheet and bake at 350 for 10 minutes. (Convection ovens bake at 325 for 7 minutes.) I like sugar cookies to be pretty soft, so I tend to under cook them. I took mine out of the oven when they were just starting to get golden around the edges. They ended up being soft and yummy for several days. 6. Cool on a wire rack. ***NOTE: I used Wilton Food coloring for the first batch of icing. The colors had a little bit of trouble bleeding into each other. I contacted a lovely gal named Amanda from I am Baker. She and I met this past summer at the Baking with Betty event. 1. Use a whisk to combine the powdered sugar, lemon juice, and corn syrup in a medium sized bowl. 2. Add the milk just a drop or two at a time. You are working towards two different consistencies here. The thicker frosting should be about the consistency of toothpaste. You are going to use it to pipe around the edges of your cookies. You will also need a thinner icing used to “flood” the cookies. The thinner icing should resemble syrup. Add the milk to your icing with these two consistencies in mind. Add your food coloring and you are good to go! Pipe the thicker frosting around the edges of your cookies. Let it harden for about 10 minutes, then fill in your cookie with the thinner frosting. 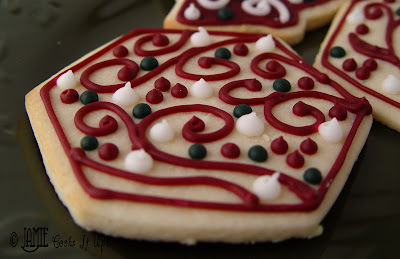 You can make some really fun designs by using two colors of the thinner frosting. For the cookie above, I piped the thicker icing around the edge. Then filled it with thin white frosting. I then piped some thin red icing in lines and finished it by dragging a toothpick through the lines. Fun….oh so fun. 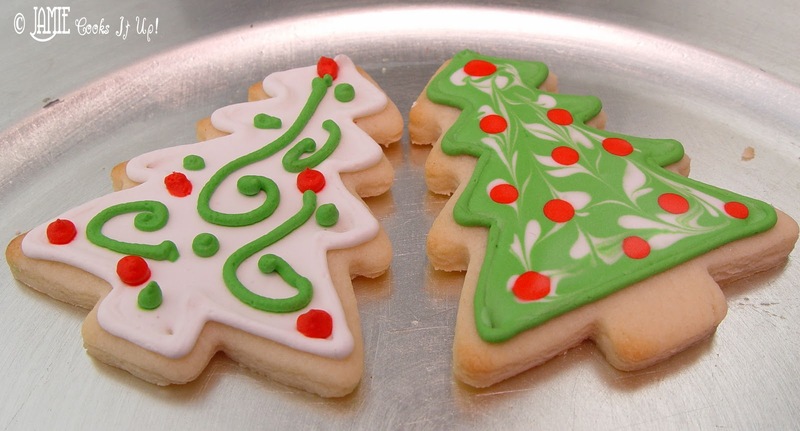 You can see that the cookie on the right has three colors of the thin frosting. The cookie on the left only has white thin frosting, the red and green were piped with thick frosting. After the cookies are all prettied up, they need to sit out and dry for several hours. I made the mistake on my first batch of covering them with plastic wrap just after they were done. The next time I saw them, the colors had bled into each other…and I was a bit bummed out! Not so fun. I didn’t curse or anything. It is Christmas you know. I’m trying to be extra nice and all. After they have had a chance to dry look how fun and stack able they are! I skipped the thin frosting on this cookie and just piped the thicker frosting all over the top. Enjoy and have a fun old time! 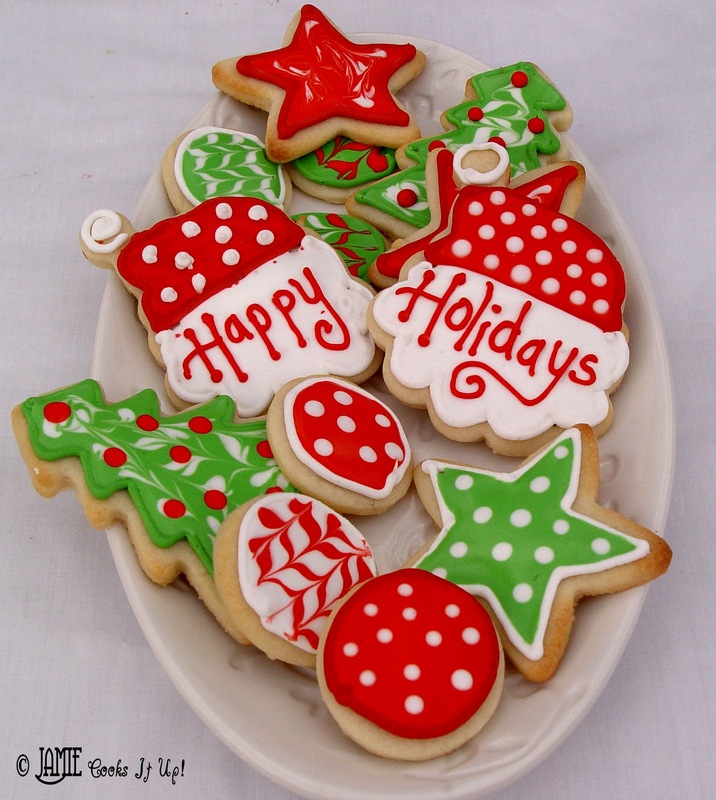 I love your tree cookie and your “Happy Holidays” cookies! They are beautiful! 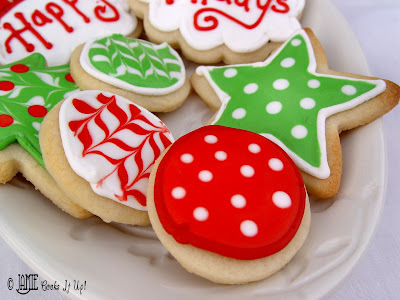 I always have high hopes of decorating sugar cookies for events, but I always realize the night before I need them that I should have started them, oh, about a month ago. One of these days I'll plan it better! I've been looking for a good frosting recipe that floods the cookies. This is perfect. Thanks! absoltuely beautiful! 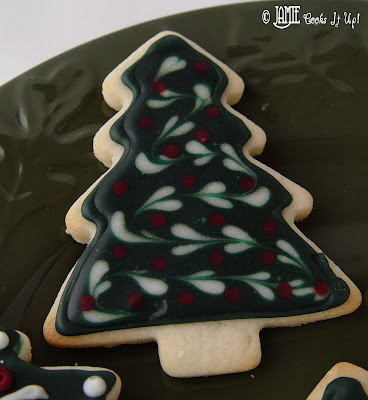 I love love the dark green christmas tree.. love your ideas! and excited to try the frosting recipe. 🙂 I'm about done for christmas, may give me something to do. lol. They look too pretty to eat! Oh, my gosh! Those are too beautiful to eat! These cookies look so pretty Jamie. I'm going to Hobby Lobby to stock up on all the fun stuff to help us decorate our sugar cookies too. Holey moley, these are cute, and adorable, and beautiful and I just LOVE them! Next time I make sugar cookies I am for sure going to try out these techniques. Hopefully this week sometime. Pretty much done w/ Christmas stuff…pretty much. Gotta wrap toninght, then I think I can say DONE! Thx, I love this kind of stuff!! Jamie, you are incredible. These cookies are gorgeous. I think I'll come over and eat one. I'm quite sure I could never make anything so cute, but one day I might actually try. LOVE LOVE LOVE your cookies! and the recipe. subscribing and following your blog now. Great job! You are really talented! Can I use imitation almond extract for these cookies? Yes, you can use imitation. Good Luck! 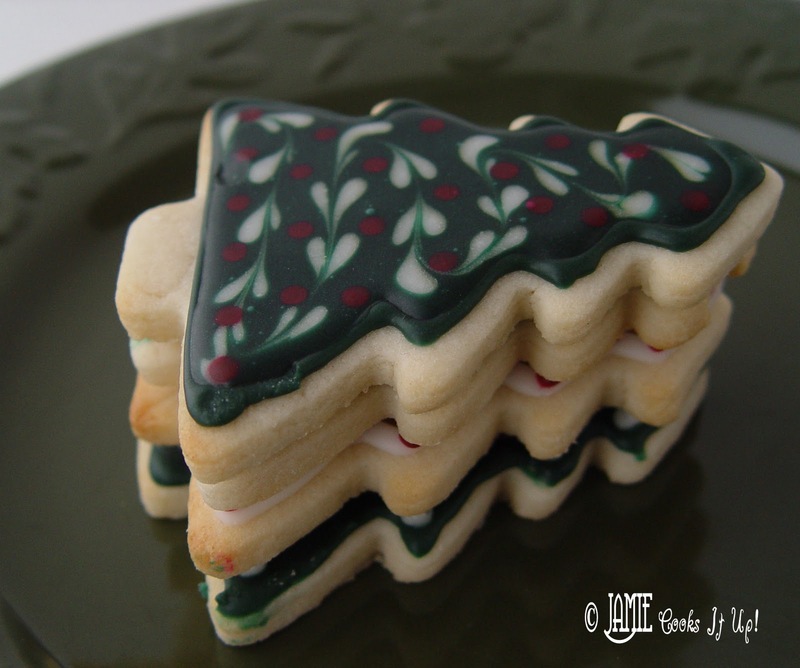 I’ve used a similar recipe but the thicker icing would always get smashed or smeared or fall off after they had dried overnight when I would stack or package them. Have you had any trouble with these doing that? Is it a teaspoon or tablespoon for the sugar cookie frosting? How’s the cookie? Soft or crisp ? We did not like this cookie. Had a metallic flavor after a few bites. Did not retain crisp cookie shape as baking soda makes cookies puff. 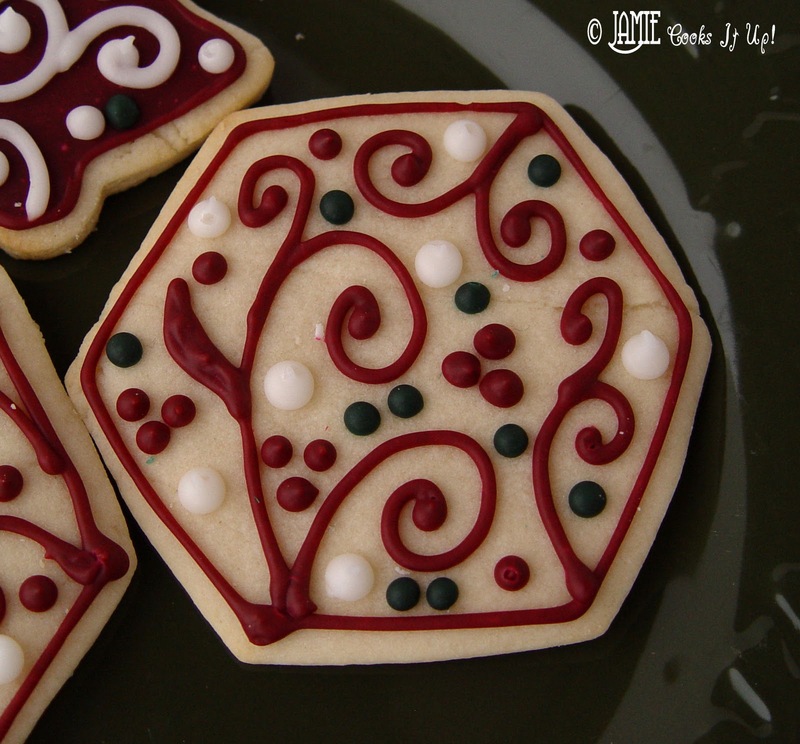 However, your cookies are beautiful and liked all your suggestions for glazing. Out of six sisters, my niece had the BEST recipe – thick and soft and uses vanilla, almond and butter extract and baking powder.